Few venues will ever be able to claim showcasing such a broad array of genres in its first few months of operation like the OKC Downtown Airpark. The brain child of Kirk Humphreys and Howard Pollack, the Airpark, which happens to border the crystalline Oklahoma River just to the south, opened its concert season with Sublime on July 25th and will host Motley Crue along with Stone Temple Pilots on September 13th and The Lumineers on October 3rd. If you know anything about these four groups, then you can see just how diverse the lineups at the Airpark already are. 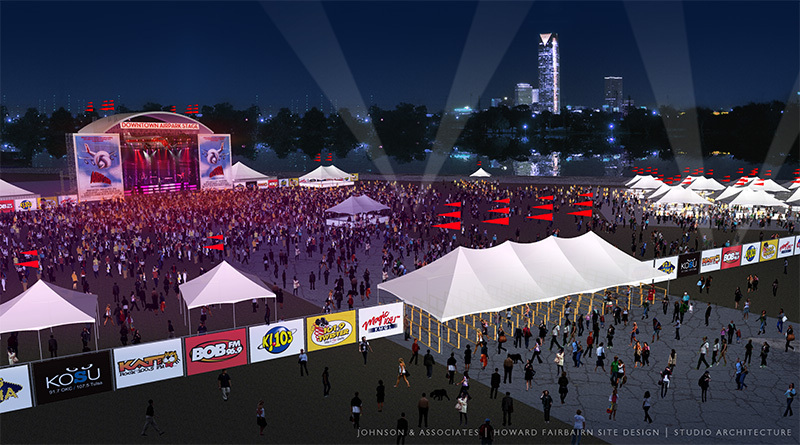 After the closing of the Zoo Amphitheatre, Oklahoma City was left without a go-to mid-size location for bands that typically do not play arenas or very small clubs. Kirk Humphreys set his eyes on purchasing the Downtown Airpark, which he did for a cool $7.2 million. The Airpark is on what Humphreys describes as a “short term lease” with Howard Pollack, President of the PM Group Artist Representatives, Inc., which happens to be the organization that handles the scheduling of shows for the Airpark. The PM Group also is in charge of booking bands in casinos across Oklahoma.